Today I just wanted to share what my friend Becky and I wore to church over the weekend. Both skirts we are wearing are from my shop. May I say, it’s such an privileged for me when I see the ladies wearing things from The Modesty Walk Shop! I’m honoured to serve them in this way. 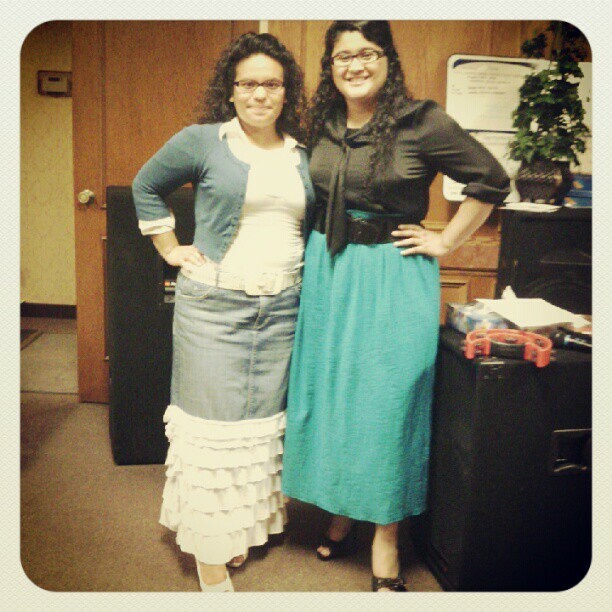 The skirt Becky is wearing was a short plain jean skirt and I customized it by adding those beautiful ruffles! This is actually something you could do yourself too with a little creativity to make those shorter skirts a little bit longer, or of course, if you don’t have the patience or time to deal with sewing, you could always bring them by the shop for me to do some alterations. I find it so fun to see the end results and so fun trying to figure out which fabric & sewing technique would look best. It’s great to let your mind go wild sometimes. Lol….The skirt that I am wearing I made out of some beautiful Knit material. I must admit, it was a challenge when I got 2 other orders for the same skirt, but I’m happy with the results and the customers were happy too!